Especially in winter, birds like to perch in my neighbour's Silver Birch tree. From early morning, the branches catch the sunshine. That was easier for me...Silver Birch is definitely not a Scottish Island! ;) lol ...no alcohol tonight either! Another lovely pic,Terra.we don't see them here either ..
We don't get these either, lovely photo Tt. I hope there will be many more visits ! Lovely to see your birds TT. 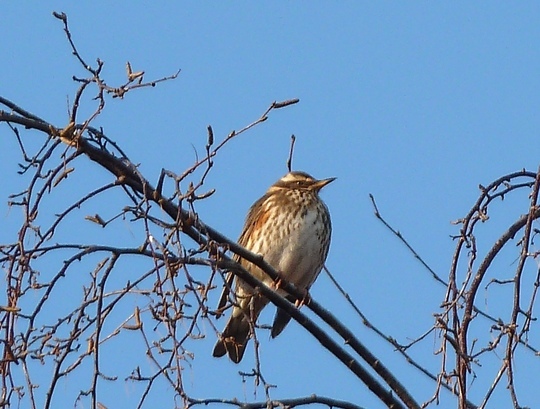 We have not had many Redwings this winter. They usually arrive in a flock and descend on the yew tree to eat the berries and they do a good job of polishing off late apples. We have had an unusually large number of very large flocks of chaffinches. They come every few days. Whether its the same flock or different ones is hard to tell. Hi Scotsgran .. nice to see the finches. Beautiful sight - we don't seem to get those around here unfortunately. This is the first Redwing I've ever seen in my garden. On a news about wild life they reckon we are going to get more wild life even some exotic kind so you never know Terratoonie you might get more. Lovely Picture, Terra, but I've never seen one of these here in Lincolnshire. I'm hoping more Redwings will visit my garden.